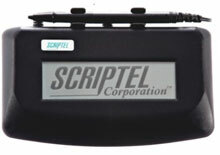 It is replaced by the Scriptel ST1501B EasyScript LCD. The ST1501 Signature uniquely passes signature data points in a format friendly way to all major web browsers. We greatly reduce the amount of testing needed to support the ever changing browser landscape. By using standard drivers common across all major computer operating systems, the ST1501 Signature Pad does not require any additional software installed to client machines.